That is how the system is supposed to work. Donelda Pulex stepped off the airplane into the sun, clutching her 5-year-old daughter’s hand and burst into heaving sobs. Fourteen-year-old Hermelindo Juarez hid his face as his father comforted him. Efildo Daniel Vasquez walked cautiously behind his 8-year-old son. Greeted by first lady Patricia Marroquin, they lined up on the tarmac, shuffling – their shoelaces had been taken as a security precaution. U.S. immigration officials handed over paperwork in manila envelopes to Guatemalan officials. The immigrants walked single-file into a squat gray building at the country’s military base to be processed back into their country, along with dozens of others also deported. 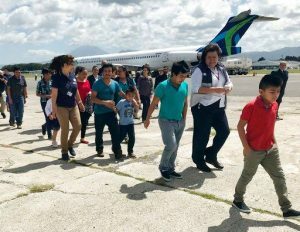 Chartered flights full of deportees from the United States regularly arrive in the Central American country, but Tuesday’s flight was among the first containing families separated at the border under President Donald Trump’s contentious zero tolerance policy. More than 2,300 children were separated from their families before a June 20 order stopping the practice. While some Central American migrants say they were fleeing to protect their families from severe violence, parents who spoke with The Associated Press said they made the difficult, dangerous journey to the U.S. for a better life. They were seeking a chance at a steady job or a better education for their children. They didn’t know they’d be separated from their kids under the policy that criminally prosecuted anyone caught crossing the border illegally. Trump administration officials had said the policy was necessary to deter a growing number of families from Central America who were crossing illegally. But the president backed off following a national and international uproar, ordering an end to the separations on June 20. While frustrated that their difficult journeys had ended in failure, the families were relieved their ordeals were over. Pulex said she spent nearly two months apart from her daughter, waiting in an El Paso, Texas, detention center, first for the resolution of her criminal case and later for deportation proceedings. “It was a great torment,” she said, wiping tears away. “I did not know if I would ever see my daughter again. I thought she was taken from me forever.” Her little girl, Marelyn, dressed in a pristine white sweater and blue chiffon skirt, said she spoke to her mother by phone from a foster care home in Michigan. “My mother, she was so sad. She would cry for me, and I would tell her, Mami, everything is OK, I am OK. I will see you soon,” the little girl said. She said the people who cared for her were kind, and treated her well, but she missed her mother.